This article is not to advertise what I did or expose myself but I am writing this article with a hope that this information will be helpful to all the people from all over the world to know about the Annapurna circuit trek and make their own travel plan. Yes, there are travel guide books and also travel and trekking agencies around Kathmandu and Pokhara where you can go and pay some money and get services and information. You can even hire guides as well. No guide books and information (including this one) is absolute and complete but the thing is that it is good to have reliable information before you make your travel plan. And I wish this free of cost infomercial will help you a lot to make your travel plan. I took this photo as i crossed Humdi. I was on other side of the river and was seeing caravan of mules coming towards the river. On the backdrop lies Annapurna (most probably). Annapurna region has different trekking routes and here I have attempted to give some ideas on popular Annapurna circuit trail through Thorang Pass – the biggest pass of the world. 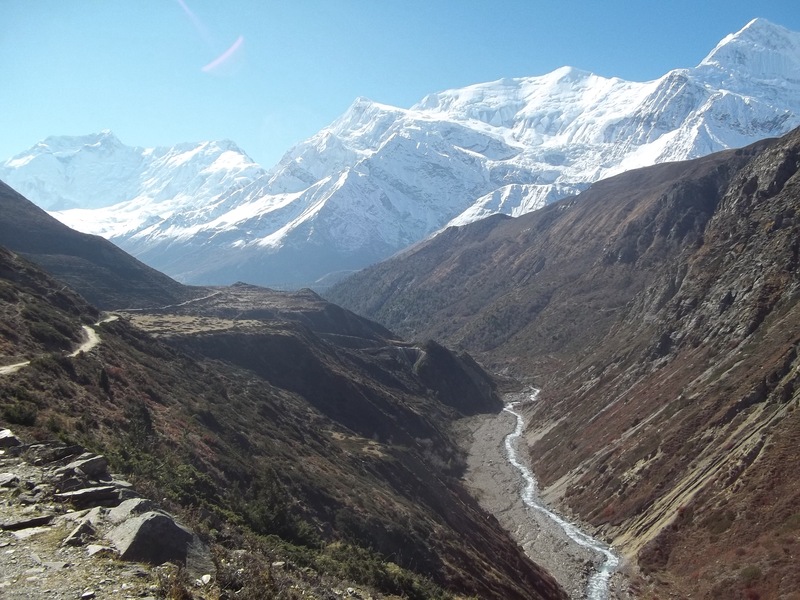 Another popular trail is Annapurna Base Camp (ABC) which you can travel starting from Pokhara and is not as long and challenging as Thorang pass. Previously Annapurna circuit was 20-25 days long route but these days bus route has been opened up-to chame (district headquarter of Manang) and muktinath on the Mustang side. 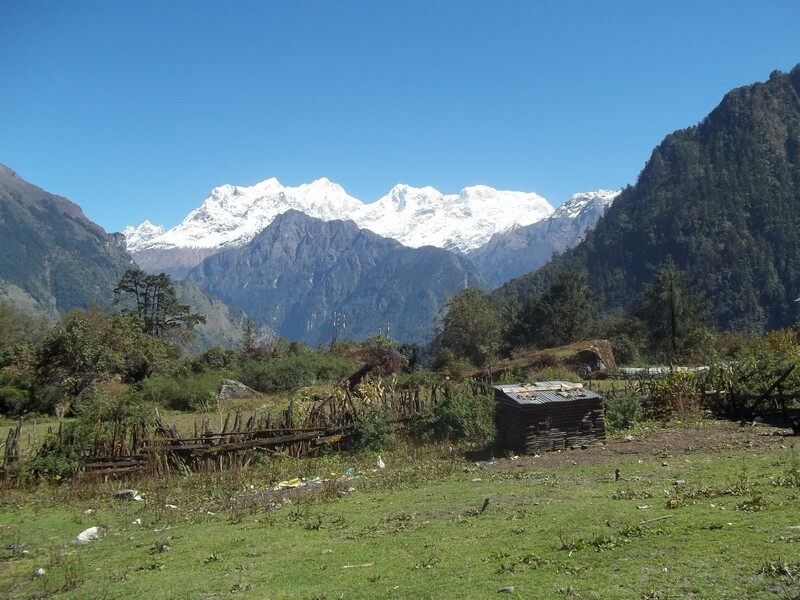 So, the Annapurna circuit trekking has been reduced in number of days it takes to travel. Despite all these, you will find people who took different number of days to complete the Annapurna circuit. Travel time duration depends on many things like: your stamina of walking, weather conditions, your travel plan, external factors like the socio political situation of Nepal. The best time to travel in Nepal is between October to December as the weather during this period is clear with no rain and clouds, mild temp with average temperature between (20-30)0 C. Travel plan to cross thorang-pass does need some preparation and I suggest everyone to make your own plan because information provided by other people or popular guide books don’t exactly fit your personal conditions. They provide you only some rough ideas and yes it is good to have good deal of information before you make your travel plan. 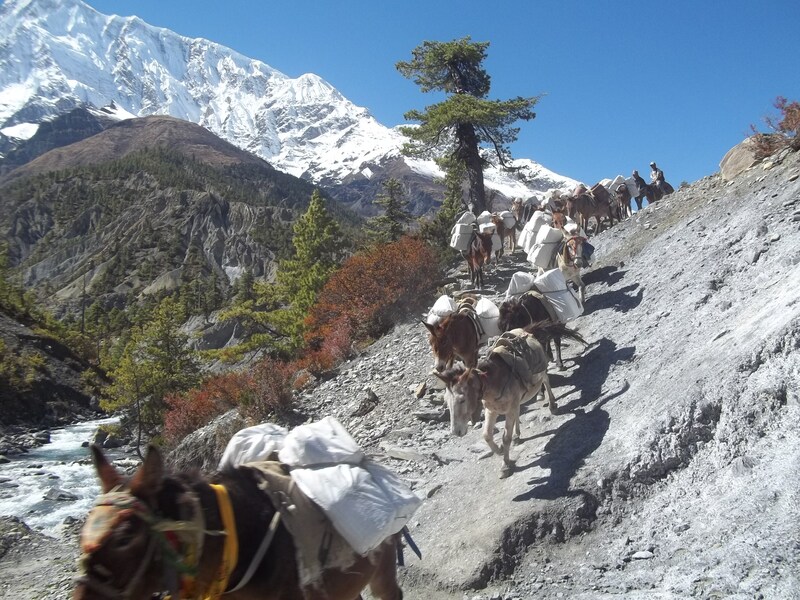 For example I did it in 7 days – one of the worst way of travelling Annapurna circuit. It is good to make a travel plan of at least 10 days. This way you will stay longer in beautiful places and enjoy the beauty of nature and the most important thing is that longer you stay in high altitude areas more time you get to adapt with the climate. Otherwise, you will fall sick and have to cancel the whole trip. Generally people get caught by altitude sickness beyond the height of 2500m from sea level. But this happens very rarely. The most challenging factor in crossing Thorang-pass is altitude sickness and weather conditions. Regarding weather conditions, you won’t have much problem if you choose right seasons I have stated above (October – december). Regarding altitude sickness, the best way to avoid it is to travel slow and steady with some preliminary measures. Thorang pass is at an altitude of 5416m and at this altitude everyone finds it difficult to breathe due to the low concentration of oxygen at this altitude. When you get caught by altitude sickness you feel like vomiting, you get dizzy and sick. A lot of people talk about altitude sickness in the route. But remember very old lady who are 80 yrs old also cross Thorang pass. So, don’t get psychologically overtaken by rumors. Walk slow (about 4-5hrs a day), drink enough water, take enough rest and sleep well. Don’t walk in a way that makes you exhausted. Remember you have to walk for about a week long time, so don’t drain out all your energy in a single day. After you reach thorang phedi (around 4500m), stay there for a day if you get exhausted so that you get acclimatized and take enough rest. In case you get caught by altitude sickness or feel difficult to breathe take rest and descend to lower altitude. There are medicines (like acetazolamide) for altitudes sickness but they don’t work absolutely once you feel difficult to breathe. So, the best thing to do is to descend down to lower altitudes where the concentration of oxygen becomes high. In case you get severely ill you can find horses to carry you and up-to manang motorbikes are also available. If the situation is worst and totally out of control helicopters can be asked for help. Daily several flights are made by copters in manang. People rarely cross thorang pass from the muktinath side because you have to climb steep mountain (2000m) in a single day in doing so and there are no lodges to stay from muktinath until you reach high camp crossing thorang pass. So, almost all visitors start their trek from Besisahar. View of Mt. Manaslu as seen from Teemang Besi. I started my journey from Kathmandu. You accordingly plan your journey based on where u start from. One can find bus from Kalanki, Kathmandu to Beshishar (district headquarter of Lamjung) easily on regular basis starting from early in the morning. Microbus fare (from ktm – Beshishar) 450 Bus fare differs for larger type of bus. Food (Dal – Bhat)Banana (2pcs) 13010 Cost of food taken along the prithvi highway generally don’t vary much. Vaseline + Water Bottle + Biscuit 25 + 25 + 20 = 70 These items were bought in Beshisahar. Fooding (Chicken Rice) + Lodging Cost 250 I stayed at Chamje on the first day of my trip and fortunately Lodge owner charged only the cost of food. Bed was free with bread. On the second day of my journey I started walking at 7:00 AM in the morning and reached Dhukurpokhari at 7:00 PM in the evening. This is the worst way of doing long trek like Annnapurna Circuit. So, I don’t recommend anybody to do it in such a foolish way. Walking 12 hrs on the first day of Annapurna trekking is the worst decision one can make. Due to this reason my knees were aching so much that I could hardly fold my legs at knees. There are a lot of beautiful places like Tejang, Danaque, Dharapani etc to stay at. It is better that you walk 4-5 hrs a day so that you don’t get exhausted and choose beautiful spot to stay at night. After you leave Chame there are no spots to stay at, until you reach Dhukurpokhari except one at Bhratang (even Bhratang only has 1 or 2 houses and that too with no good facility of lodging and fooding). It takes about 4-5 hrs to reach Dhukurpokhari from Chame and this is the only section where you don’t find lodging facilities frequently and this section also contains about 1 hrs of jungle road. So, if you arrive Chame after 2 PM it is better to stay at Chame. Roti 20 Roti (chappati) is not a dry typical Indian one but the one made in oil. Handkerchief 150 In Manang you can buy stuffs you need for trekking like stick, jackets, caps etc. After crossing Dhukurpokhari you get to see panaromic view of beautiful mountains and desert like valley. I suggest you to enjoy your trekking after crossing Dhukurpokhari to the fullest. From here starts the door to heaven on Earth. Manang is like a mini town en-route to Thorang pass/ Tilicho Lake. Trekking route to Tilicho lake separates from Manang. Generally most of the tourists/visitors prefer to stay at Manang because it has bakeries, restaurant, hifi lodges and even a mini movie theatre. Mnungji is near to Manang and Milarepa cave (where Milarepa – the highest Buddhist guru ofTibetan Buddhism is believed to have meditated) and Ice lake lie around here. So, visitors generally stay at mungji or manang for a day and go to visit these places. Ghunsang is about 2 hrs walk from the Manang and from no other stations you see mountains as beautiful and nearer as you see from Ghunsang. So it’s worth staying at Ghunsang. As you go farther beyond Manang you don’t get to eat meat because of the transportational difficulties of chickens. Besides, other dishes are also available that you find in restaurants in big cities like Kathmandu and Pokhara. There are two methods of corssing Thorang-Pass. One is that you stay down at Thorang Phedi (around 4500m) and wake up very early next morning at around 3/4 AM and start to climb uphill. This way it will take you around 4 -5 hrs to cross the Thorang Pass provided that you remain fit and fine. Remember, beyond the Thorang Phedi the trail is steep and difficult. The other method is that you stay at high camp rather than to stay at Thorang Phedi. This way things will be easier another day but if you come walking long way than it is difficult to adapt at high camp which is at an altitude of about 5000m. People generally fall sick if they walk long hours and reach high camp to stay there for the night due to high altitude. I myself found it difficult to breathe at that altitude though luckily I didn’t fall sick. Thorang pass is 2-3 hrs from high camp. Wise decision is to stay at least 1 or 2 days at Thorang Phedi or high camp and get adapted with the climate and cross the pass. 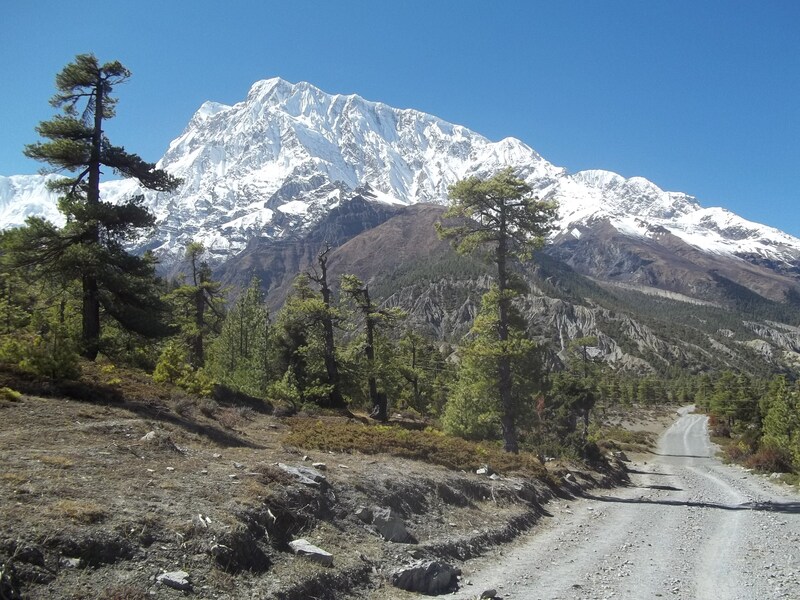 This part of crossing the pass is the most challenging part of the Annapurna circuit. The trail after you cross the Thorang Pass is vertically downhill i.e. you reach Muktinath (3500m) from Thorang Pass (5416m) descending about 2000m. Muktinath to Kagbeni is about 2 hrs walk though you can find jeep from Muktinath onwards if you don’t want to walk anymore. Muktinath, kagbeni, Jomsom all belong to lower mustang area of Mustang district but the real and typical mustang i.e. upper mustang is about 4-5 days walk from kagbeni to the north. Muktinath temple is highly revered by both buddhists and hindus and one of the most go religious pilgrimage especially for hindus. The road from Muktinath to Jomsom is quite good in context of Nepal though it is not black topped. There are different rumor about crossing the Thorang pass. 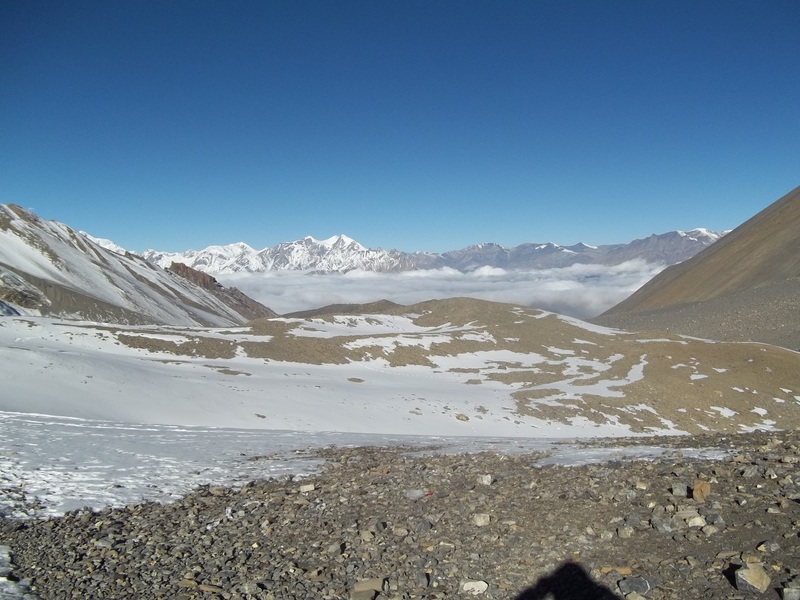 But the fact is that the weather condition is highly unpredictable at an altitude of 5416m and so different people have different experience about the pass. Popular saying is that you can’t cross the pass after mid day because of strong icy wind that blows but this is not always true. On the day I crossed the pass I met people who crossed the pass after midday also. I myself crossed the pass at 8 AM in the morning starting to walk at 6 AM from high camp. Sometimes it is difficult to cross the pass even after 8 AM as people say. All these are not an absolute truth. The truth is that weather conditions rapidly fluctuate at mountains so everything depends on the weather. However, even on the day when weather is very fine, icy cold wind blows around the Thorang- Pass and you can’t stay there for very long time due to cold winds and there is no reason to stay there for long time because Thorang Pass is only to cross, take some photographs and that’s all. Jeep Fare (Kagbeni to Jomsom) 150 Kagbeni to Jomsom is about 1 hrs on jeep and two hrs on foot. 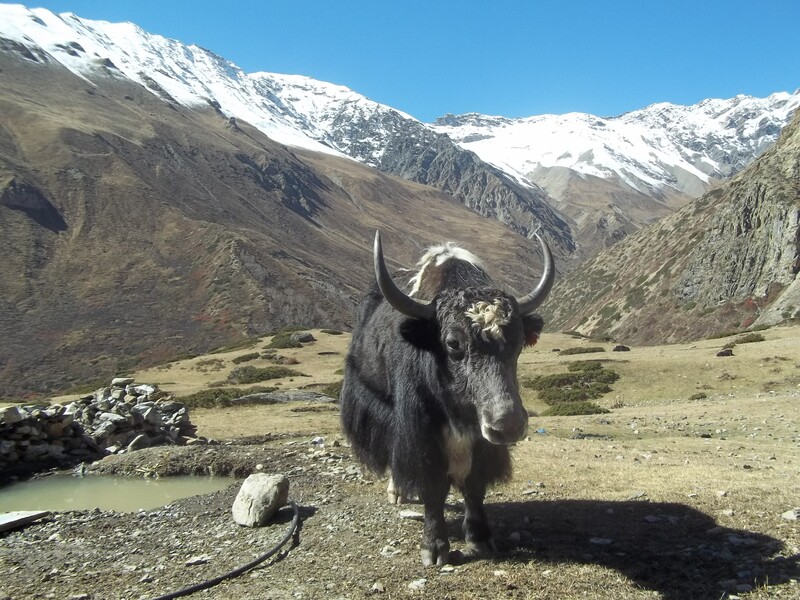 After crossing Thorang-Pass, trail is vertically downhill until you reach Muktinath. From Muktinath onwards bus and jeep services are available these days though the road is not black topped. From Muktinath onwards is the another half of the Annapurna circuit. But due to the availability of the bus services very few visitors do it on foot. Still, walking along the wide sandy bank of Kali-gandaki river is quiet exciting until you reach Jomsom or Marpha. Very few visitors walk up-to pokhara from Muktinath onwards. The reason is that you don’t see panoramic view of mountains and beautiful hills as we see on the Manang side of the circuit. For people who are used to seeing hills around Kathmandu valley, route after tukuche is not worth trekking. Bus-road is generally built on the route where previously Annapurna trail lies and the road is all bumpy and rough and in several places dangerous too. Generally visitors stay at tatopani (hot spring) that lies in between ghasa to Beni. At tatopani there lies a hot spring and is a simple station with facilities of fooding and lodging. As the road until you reach Beni is rough transportation is not as smooth as you imagine it to be in some big cities. Travelling by bus till you reach Beni therefore is an adventure in a different way. Microbus fare (Beni to Kathmandu) 780 Road from Beni to Ktm is black topped and very beautiful. On the 7th day of my journey I was back to Kathmandu completing Annapurna circuit. 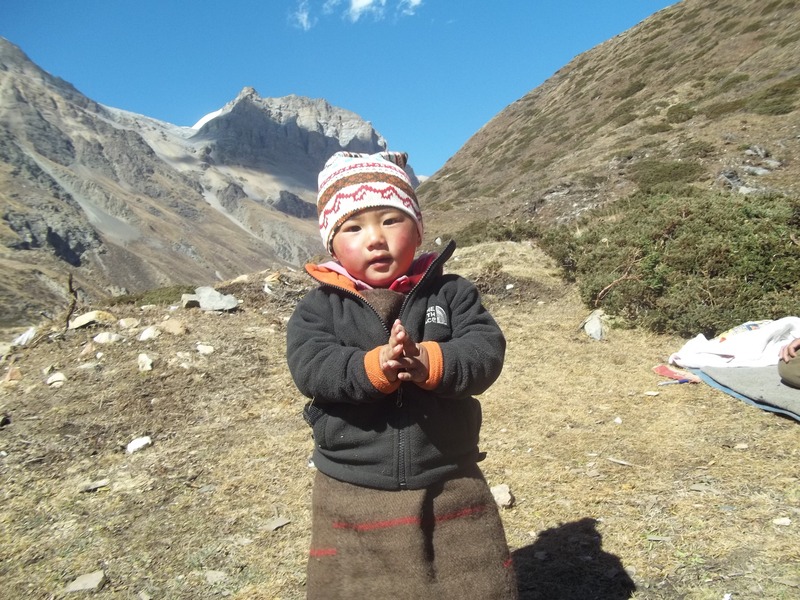 This cute little girl i met en-route to Thorang Pass is thermally insulated by her mom to protect from icy cold winds blowing through the banks of Marshyangdi river. Total expenditure of the whole trip for 7 days: NRs 9040 (91 US $ approx) . At the time of this travel the exchange rate of US dollar was 1 US $ = 99 Nepali Rupees (around). Cost of goods and services do vary along with time and I suggest you to take notice of the time when this travel was made. For your convenience I have mentioned below the average cost of some items so that you can compare and analyze the costs at the time you travel. All these prices are only approximate prices. Prices do vary depending upon the time and places. Warm clothes (jackets, socks, caps, trousers etc). Until you cross manang the temperature during October-December is mild and you can even walk with tshirt and half pant during the day time. Temperature during the day is around 200C. During the night time if you stay at lodges they provide you enough blankets and beds. But if you are going to camp on tents you need to manage accordingly. There are facilities of camping also on several spots. Temperature above thorang phedi drops to minus during the night time and while crossing the pass icy cold wind blows so you need to thermally insulate your body. Sunscreen and cold cream to prevent your skin from crack. Trekking stick (if possible get 2 pcs if not at least get 1). You can find trekking stick for NRs (300 to 1600) around Thamel and in case you forget to buy one you can buy it in Manang. Toilet Paper. Generally Nepalese don’t have habit of using toilet paper but as you ascend higher using icy cold water becomes really challenging so don’t forget to carry it. Simple first aid items like medicines for headache, sickness, diarrhea etc. Gel for massaging legs, knees and body is really necessary because your legs and knees ache after walking hours long each day. Don’t forget to carry your regular medicine if you are in some type of medication. Soap, toothpaste, shaving creams, menstrual pads (for females)etc. Cameras. Generally most of the stations have facility of electricity so you can carry your battery charger and other electronic goods with you. In Manang there is also a facility of internet. Last but not the least, don’t forget to carry a trekking map with you. You can buy it in stationaries or map house. Of course you need to carry money (lol) and other requirements vary depending on people to people and you need to identify it yourself. Another important thing to remember is people generally either miss or lose their things due to improper packaging of bag-packs. Best idea is to have a single trekking bags where you can keep all of your things and carry it. Remember, keep your money, travel documents (if you are not Nepali) and goods you frequently require with yourself in a small bag, like you can use waist bag for this purpose. You load your trekking bag on the roof of bus generally so have a small bag with you to keep money and important documents with yourself. It is very likely to lose or miss your bags in the bus or lodge if you carry many bags and items.